The Forged Billet Dynalite-M is further enhancement of the venerable Forged Dynalite series calipers. 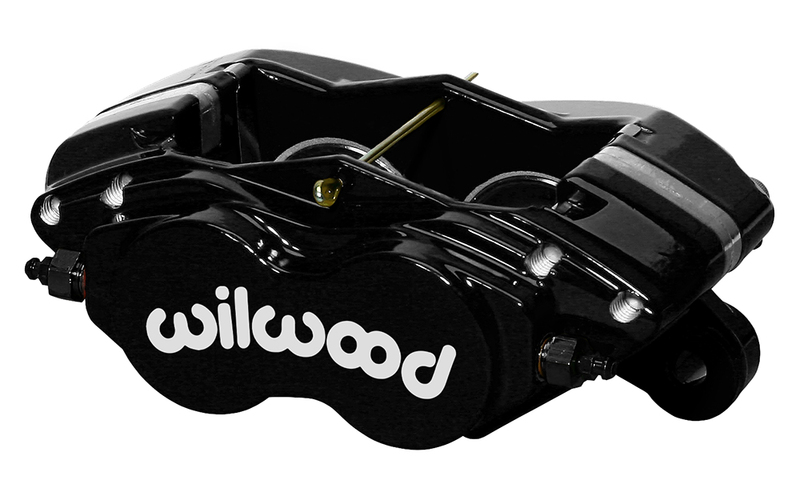 Specifically designed to enhance outboard clearance and is the basis for Wilwood’s new Classic Style brake kits. The latest applied developments and innovations in caliper design and manufacturing processes have resulted in substantial improvements in strength and performance over all comparable models. The Forged Dynalite-M is the strongest calipers in the class, with weights starting at 2.80 pounds. The process of stress-flow forging re-aligns the metal's grain structure within the contour of the caliper body. This process eliminates the breaks and interruptions to the internal grain structure that occur when machining a straight block billet. The FEA generated radial transition design eliminates steps and shoulders in the area between the piston housing body and the caliper bridges. Incorporating a radius in this transition area substantially increases resistance to deflection and caliper separation under load. Structural deflection and volume displacement tests have proven the Forged Dynalite to outperform all existing styles of this popular caliper size. Without even considering the overall greater strength and reliability of the forging, the reduced deflection tendencies and the resulting decrease in fluid volume displacement translate to increased clamping efficiency with less pedal travel. The bottom line is a taller pedal and better stopping power.